Who was the most accurate driver in NCAA women's golf during the season that concluded in Spring 2010? Sara Hurwitch. Now she's on the Duramed Futures Tour as a rookie. Sara began her college career at Central Florida, where she was the Freshman of the Year in Conference USA. 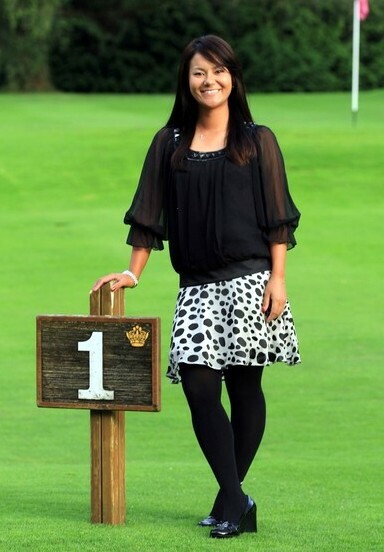 She ended her college career at Kentucky, turning pro after graduating earlier this year. Her degree? Psychology. Which would come in handy for any golfer. In the image above, Sara sports the Black Seville by Donna Bonn Designs. And you know what that makes her: one of the "Bonn Girls." 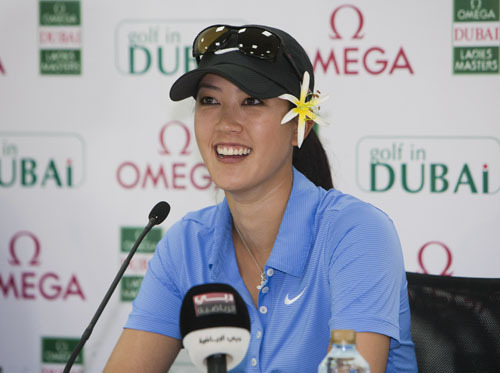 Michelle Wie won for the second time on the LPGA Tour, taking the title at the 2010 CN Canadian Women's Open. I think what impressed me most is not what Michelle did, but who was waiting at the final green to congratulation her. Cristie Kerr. Kerr, an intense competitor, was once one of Wie's biggest critics. Now she waits by the green to give Wie hug. There's no bigger sign of how much her peers' perceptions of Wie have changed for the better over the two years she's been a full-time LPGA member. 11. What is the quality you most like in a woman? Ohhhhhhhhh-kayyyyy. Than answer followed a question about what she liked most in a man, and her reply was, "Big wallet (joking!)" So I think much of Maria's Q&A was tongue-in-cheek. Or is that toe-in-cheek? Her name is Bonn. Donna Bonn. And she's the creative force behind apparel company Donna Bonn Designs. You've probably seen a Donna Bonn Designs top already, even if you didn't realize it at the time. The top Sara Brown wore in her elimination episode of Big Break Sandals Resorts was the Donna Bonn Designs "Purple Abbey." Bonn's apparel is worn by a growing collection of women's touring professionals, pros who collectively have come to be known as the Bonn Girls. In the image above, Brown, Taryn Durham and Lindsey Bergeon sport tops from the DBD Taylor, Seville and Abbey collections, respectively. And in the photo to right, Donna Bonn herself models the black Seville. The Bonn Girls currently include, in addition to Brown, Durham and Bergeon, Anna Grzebien, Gerina Mendoza, Kelly Sheehan, Christina Jones, Brandi Jackson, Jenny Suh and Sara Hurwitch. "The Bonn Girls have the triple threat: game, looks, and personality," Donna said. 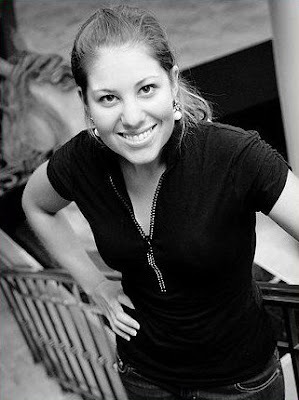 "I started my company because I was very frustrated with golf clothing options for ladies. I would take an American Eagle tank top and put it under my short, boxy, traditional golf shirts. If I didn’t put the tank top underneath, I would basically have a belly shirt ... showing at least two inches of skin. This might be fine if I am at the pool but not so much at the country club. My line is unique in its fit (contemporary), fashion (forward for once!) and fabric (organic)." Bonn has an extensive background in golf. Her father, Dan Lippstreu, played on the PGA Tour and then was a longtime club professional. Donna grew up playing junior tournaments, earned All-America status in the AJGA, and played at the University of Arizona on scholarship. Today, she's still a scratch golfer. "I am very passionate about life," Donna says. 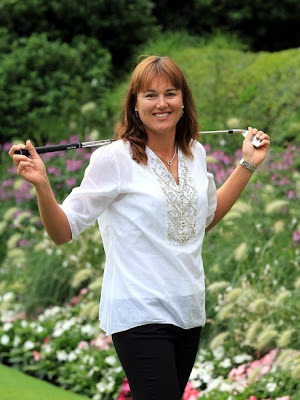 "I am especially passionate about bringing an awesome golf line to women golfers who reject that they have to wear a traditional polo shirt that is made more for a man’s body than for a woman's. My customers get compliments all day long on how great and cute they look. "And what's cool is now I have something to wear on the course that I LOVE and that looks great." She's No. 1 alright. Ai Miyazato reclaimed the No. 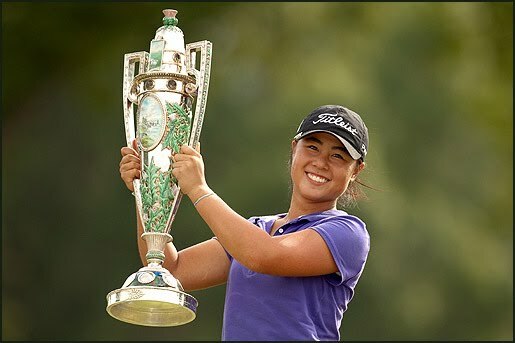 1 world ranking by winning the LPGA Safeway Classic. It was Miyazato's fifth LPGA win of 2010. Sara Brown made it to the final three on Big Break Sandals Resorts, but that's when her time on the Golf Channel series ended. Sara was ousted in an Elimination Challenge showdown against Carling Coffing. Sara spoke at the end of the episode of finding fun in the game again, which is always good to hear. She's playing a full-time schedule on the Duramed Futures Tour in 2010, something that - based on comments Sara made on the show - might have been in doubt at the end of 2009. Her best finish in 2010 on the DFT is a tie for 15th at the ING New England Golf Classic. Danielle Kang is your 2010 U.S. Women's Amateur champion. The 17-year-old Kang beat another 17-year-old, Jessica Korda, in the championship match, 2 and 1, with a birdie on the 35th hole. Despite her young age, Danielle is a member of the Pepperdine University golf team and earned conference Freshman of the Year honors during the Spring season. She graduated high school early and entered college early. She also played her way into the 2010 U.S. Women's Open and Oakmont and made the cut. Like many women in the first year after childbirth, Tina Lloyd - who welcomed her first child earlier this year - had a goal: Get rid of that baby weight. So she went on a diet. But did she find one that worked? You bet. Lloyd - the former collegiate all-American, Futures Tour player and Big Break Kaanapali contestant who you might better remember as Tina Miller (her husband is NFL placekicker Rhys Lloyd) - tried eDiets.com, and was very happy with the results. You can see those results in the photos here. Tina was so happy that she contacted eDiets.com to let them know, and now she's serving as a spokesperson for the weight-loss company. Great timing for Tina, who is transitioning from the life of a touring pro into the life of a wife, mother - and television personality. Keep your eyes open beginning next week for Tina in eDiets.com TV spots. We'll see her in 2-minute, 1-minute and 30-second spots airing on NBC, ABC, CBS, MSNBC, CNN and other networks. Tina's been blogging about her new journey as a mom at her site, tinalloydgolf.com. She's also writing about her weight-loss success with specifics on what has worked for her. (Hint: Tina's been using the eDiets Fresh Prepared Meal Delivery Plan). In addition to her time on Big Break, Tina has served in the past as co-host of a 30-minute PowerBilt infomercial that was in rotation on the Golf Channel. I'm sure we'll be seeing plenty more of her on our television screens in the future as she considers more hosting opportunities. Don't get the idea that this was some kind of Mickey Mouse outing for Paula Creamer. No, sir: This was a Minnie Mouse outing. "Reigning U.S. Women’s Open champion Paula Creamer enjoyed some time on Monday, August 9th with fellow Orlando resident Minnie Mouse. Creamer, who provided Minnie a putting lesson after arriving in a custom golf cart, was presented with a cake to celebrate her recent birthday (she turned 24 last week)." A win for Sophie Gustafson on the Ladies European Tour (of which she is a lifetime member). Sophie shot 66 in the final round and birdied the 18th hole to finish at 12-under and win the AIB Ladies Irish Open. It's the 14th career win on the LET for Gustafson, but her first since 2007. 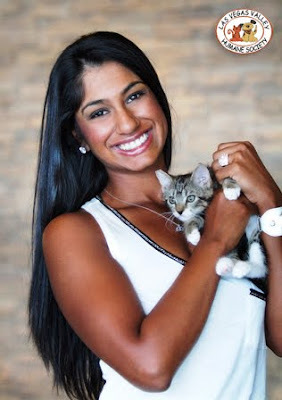 And so the time has come to say goodbye to Seema Sadekar as a contestant on Big Break Sandals Resorts. Alas, Seema was eliminated in the seventh episode. In her blog on About.com, Seema wrote, "To everyone who enjoyed watching me, this won't be the last time you will see me sparkle and shine! ... I have to say, this show may be someone else's 'big break,' but mine will measure greater. Thank you to the Golf Channel and I love you all. Stay sparkly!" Stay sparkly. That's always sound advice. Quoting again from her blog, Seema writes, "I am now a spokeswoman for the Humane Society in Las Vegas - please reach out and sponsor a helpless animal in your community. If you save a precious puppy or kitty, they will in turn make your day brighter. 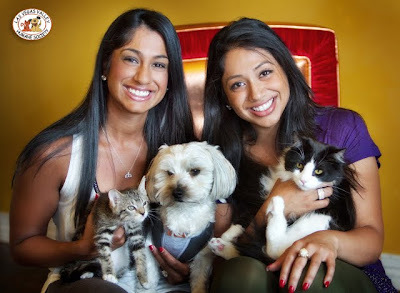 My animals are my best friends, and they've made me realize that life is full of love!"